Adopting a rescue dog is a wonderful way to expand your family and give a loving home to a dog in need. There are so many amazing dogs in shelters just waiting to be adopted. Talk to your local shelter about what you’re looking for in a dog and see what is available. Learn about the temperament and characteristics of various breeds to find one that would fit well with your family. Where the dog will sleep, eat, and relieve itself. Find out what kind of food the dog was given and how much so you can continue this same routine. If you’re planning on changing the dog’s food, do so slowly so their body has time to adjust. And don’t forget to bring a collar with ID tags and your phone number so your new dog has identification. Having a rescue dog can be incredibly exciting, and it’s tempting to want to show him or her off to family and friends. However, it’s a good idea to keep things quiet and controlled at first. Focus on letting the dog get used to you and your immediate family as well the house and any other pets before having visitors. Set ground rules from the start. Some rescue dogs are already very well trained from previous owners while others are not. However, you’re bringing them into a new environment where they’re not sure what to expect, so even if they are trained, they may still have accidents or act up at first. Let the dog know your expectations. If you don’t want them to jump up on you when you come home or to get up on the couch, don’t let them from the beginning. It’s hard to break habits once they’ve started, so remain consistent with the rules. Crate training your rescue dog can be a wonderful option and help them feel safer and more secure. Leave the door open so they can go in and out as they please while you’re home. Keeping them crated while you’re gone can keep them out of trouble and places where you don’t want them to be. Spend plenty of time letting the dog get used to your family and praising them for positive behaviors. Sign them up for a training class if they’re not already trained so you can establish a strong relationship and teach them to follow commands. Make sure you’re ready for the responsibilities of caring for a rescue dog before adopting. Understand the commitment and realize that it may take some time for everyone to adjust. Most importantly, enjoy the companionship, love, and laughter that a rescue dog can bring to your home and life. 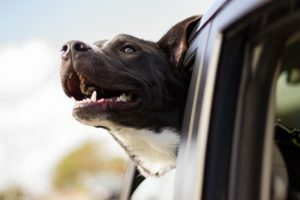 If you’re looking for a safe, fun environment for your dog while you’re at work or on vacation, check out Lake Wylie Pet Resort for boarding, doggie daycare, and grooming services. ← WELCOME TO THE LWPR BLOG! CHECK BACK FOR REGULAR UPDATES!